This week we are going to declutter things we thought we loved. Well let’s face it all clutter could fall into that category. In this case though I am talking about things we acquired because we thought they were great or kept for sentimental reasons but have since become emotionally detached from. Monday – There is usually at least one make-up item among the others that we once thought suited our peculiar kind of beauty but now wonder where we got that idea. If you have such an item but haven’t had the sense to throw it away yet, today is the day. Tuesday – How many handbags do you have and how many of them do you actually use. Declutter one that that you haven’t used in a long time because you don’t love it like you once did. Wednesday – Declutter one of those once favourite outfits that you never wear any more. Chances are it is now way out of fashion. Thursday – Check your keepsake box for something you kept but now wonder why. Declutter anything that you feel this way about. Friday – What is on your walls? Is there something hanging there simply out of habit that you don’t really want or even particularly like? Now is the time to declutter it. Saturday – Have a look in your display cabinet there is bound to be something lingering in there that you long ago lost interest in. Time to send it to the thrift shop. Sunday – Look in your jewellery box – Are you really going to wear all of those earrings again or that ring your old boyfriend gave you? Time to cull a few things in there don’t you think? What is the use of keeping items that just don’t work any more. 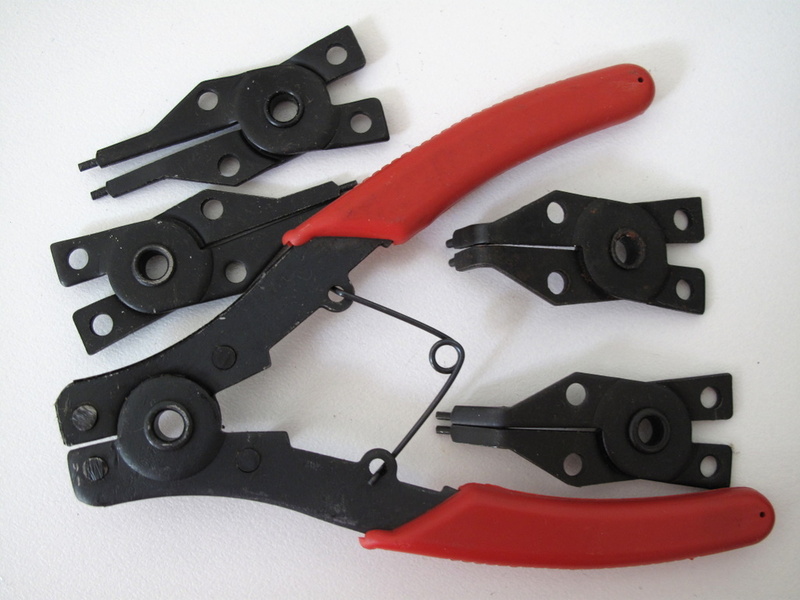 In the case of these circlip pliers none what-so-ever. I used them for stretching sliver jump rings for making jewellery chains but they broke soon after buying. Needless to say I was not impressed. I hate shoddy products. I am grateful for what was a restful Christmas and now it is time to get back into some serious decluttering. The craft supplies are first on the list. I have some ebaying to do. Some great suggestions too Colleen for finding those “hidden” items which are often out-of-sight, out-of-mind; makeup, jewelry, handbags, clothes. Thanks for jogging my brain! you can’t possibly have anything else left to declutter I don’t think. You have been with me so long and moved so many times that I am guessing you have eliminated just about everything that is no long essential in your life. It has been amazing to view the changes in your life through our blogs over the last year and half or so. We have both had our ups and down but yours has been a real adventure. Good luck finding anything on the mini mission list to declutter. Betty Jo, I would imagine that the grief has been the worst part. Everything else seems harder when there is sadness to contend with. Although your illness certainly made it difficult to find a dwelling that you can tolerate. I have it easy, aside from my boy scaring the daylights out of me on a yearly basis the only thing I have to contend with is my own silly head driving me crazy on occasion. Mind you it is a little hard to escape that at times but I have learned some good strategies to cope with it and my husband has learned to be patient with me (I think). I sincerely hope it is a good year for you Betty Jo and that you enjoy life, family, your art and your charity work. mini missions are only a guide to removing things you no longer want. If you love all your bags, make-up and wall art then declutter something else. I am concentrating on my craft room this week. I think I could find 365 items in there without looking anywhere else. Convincing myself I no longer use them and probably aren’t likely to either that is the tricky part. My determination to declutter usually allows common sense to prevail though so I am making progress. I guess since I’ve been de-cluttering for a couple years now I have finally gotten down to the hard stuff. I did get rid of three bags last month, but there are still some that need to go…I’ve procrastinated with other stuff long enough 🙂 I had a lot of scrapbooking/craft stuff too but moving into a smaller apartment convinced me I had to let most of it go. Faith, it is actually a blessing sometimes when life interviens and helps you come to a decision you were avoiding. For me I visualise downsizing our living arrangements and that helps me make the decision now so I don’t have to deal with it later. What a great list this week! Especially about the make-up. I’ve read that one is not supposed to keep most make up longer than a year and some like mascara, no longer than 6 months because it develops bacteria which can cause skin/eye infections! I don’t wear enough to use up most of my make up in a years time, so I have some purging to do!! Purses are my weakness. I find GREAT ones at a local thrift store, so after culling out about half of them last summer, I now make myself get rid of one if I buy a new one. Which means, when I see one at the thrift store, I have to decide…do I REALLY like this one MORE than the ones I already have at home? It has helped slow down the purse purchases for me!! Colleen, I’m going to be doing the scrapbook decluttering this week like you. I look at all I have and I KNOW that I don’t need half of it. I’m excited about getting rid of a bunch of it. I want room for other things that right now are either in boxes stashed somewhere or that are scrunched into a drawer that is way too full. Good for you Deb J, I find that I just have to be realistic about whether I am ever going to use the stuff and most of the time the answer is no. Some of it has barely been used in six years so what is the likelihood that I am suddenly going to be inspired by it. Hi Ann, I am surprised that mascara has dried up long ago. I have to confess that the lipstick (only one left) that I am using at the moment must be about a decade old as well and almost run out. When I do go out to the shops I can’t be bothers faffing around trying to choose a new one. My neighbour commented that I smelt nice the other day. I told him that is because my husband bought me some new perfume for Christmas. I haven’t worn any since mine ran out about three months ago. I am starting to think I am getting a little feral because I spend so much time at home with my head in my laptop. I haven’t owned an eyeshadow for many years. Brow pencil, mascara, lippy and mineral powder is about as much effort as I am prepared to make for the sake of vanity these days. I have a lipstick. I use it on Sunday’s or very special occasions. I am allergic to makeup and finally realized that it didn’t matter how hypo-allergenic it was supposed to be I still reacted to it. So I got rid of it all. sometimes allergies can be a blessing in disguise, at lease you have a good reason not to bother wearing make-up. I know that is stretching it a little but I like to be a cup half full kinda gal. Hi Colleen, so far today I have tossed 2 items (broken), given away 3 things (to my brother), recycled some old cards and envelopes and have a bag of 14 things for the thrift shop. Not a bad effort for less than an hour’s work! I’m going to keep a record of how I go this year, much like your blog except in a note book. It will be good to see how far I’ve come at the end of just one month, obviously I won’t be quite so good with the decluttering every day, but every little bit helps! Cheers, Judy from a very hot Adelaide! well done, what a great way to start the year and all accomplished in just one hour. Talk of recording your declutter items has given me an idea for a post, starting with a huge collage of last years decluttered items. I love photo editing software. I wish you good luck maintaining your momentum and I look forward to hearing about how far you have come at the end of the month. Judy, I like your idea of keeping a record. I haven’t been up long and I already have two items I am giving away. I’m going to keep a record too but in an Excel spreadsheet. Good idea Deb J, recording on computer takes up less real space. Have you considered used something like Google Calendar to record your decluttering data. Hadn’t thought of that. I will have to check it out. Thanks for the idea. Hi Nix and may I extend to you a warm welcome to 365 Less Things. I am glad you found us and let us know you have joined us. I hope you find my blog inspirational and it motivates you to get moving again with your decluttering. You are right about one thing, blogging about it does complicate the process of decluttering, that’s for sure. But at the same time it has kept me on track and in return for assisting my readers to achieve the results they are hoping for they inspire me at times and give me ideas I hadn’t thought of myself. I didn’t actually start my blog until I was 64 days into my 365 less things challenge but I did take photos of the things I declutter with the intention that I might start blogging later on. So Nix, please drop in a have a chat with me, Cindy and the other readers whenever you feel like it. We would appreciate your input. Willow, I used to do the same thing years ago but I set up a data base on the computer for it. Whenever we would move to a new place I would make comparisons to be sure I made the best, most economical choice of where to shop. Now I am leaning towards shopping more sustainably which is always going to be more expensive than the big chain stores but since we are better off financially these days I am not so concerned. Shopping as local a possible is more my focus now. Shopping locally is our focus too–we purchase everything we can at the farmers market each week and then fill in at Trader Joe’s. As my husband says, he can keep most of the prices in his head. I can’t but either we shop together or he does the grocery shopping. If I need to, I’ll make a data base on my laptop to track the prices. you are so right, avoiding double ups is so much easier when you have less, are subsequently more organised and know where everything is. Oh my! I have a box of ‘decorative things’ and I keep thinking, I have no place for them, and do I really need them? I displayed my little earring and ring frame yesterday and thought yet again, is it worth keeping a ring my first boyfriend gave me that said ‘love always’? He’s now married (and we’re still friends, he was the first person to send something to my new address). It just seems like a waste – I mean, I can only really ‘bin’ it, cause no one would buy that would they (at a charity store)? Handbags now have a ‘real’ home in the new house (in the buffet by the door). I have 1 brown satchel type, one small foldable black one, a larger blue foldable one (the ‘work’ handbag as it fits files in it), a suede teal – the winter ‘dressy’ bag that I love to the bottom of my heart and back, and a gray clutch for my one formal dress, that i wear 2-3 times a year. And one satchel to ‘grab and go’ for overnights (has PJs, toothpaste and brush, ear plugs, deo etc). A few, but perfect number that means I no longer consider buying anymore! I definitely think there’s some make up to be sacrificed. I always wear the same stuff, and some things are just languishing in that drawer. That’s funny Snosie, I keep my handbag in the buffet by the from door as well. The good evening clutch is in a box in the wardrobe and the one other bag I own is also in the wardrobe. I am sure if that ring is a precious metal the thrift store would be more than happy to have it. We still jewellery like that at the thrift store all the time. I gave an old boyfriend ring to my daughter. She thinks it is funny that it was from an old boyfriend who I might add repurposed it to me after retrieving it from the previous GF. Small wonder that relationship didn’t last. Oh he must have been a REAL charmer! Ah Yes! I am not sure what I saw in him or why I didn’t give him the flick sooner. He was devastated when I did though. I had no hard feelings we just weren’t meant for each other and life goes on. I am very philosophical about that sort of thing. You can’t demand love and you can’t make someone into something they aren’t. Chances are, if it didn’t work out them perhaps you just chose badly in the first place. Get over it and move on. funny: I did the “use it up” technique years ago in terms of make up. since then: one mascara, one make up, one eyeliner and one eyebrowpencil. I got as a gift a glittery eyeliner from a friend. I am using it once in a while, surprisingly enough. thats everything I own. since 5 years. I just went through my jewellery and the keepsake box a week ago. I thought I would hang up stuff on walls when I moved in, but I so love my white bare walls, nothing to declutter there. and I will tackle my wardrobe as soon as I reach my goal weight. I love if I can say monday morning: Mission Complete. Well, since I don’t own any makeup, I decided to do a basket under the bathroom sink that houses first aide type stuff. Was able to throw away a couple of tubes of things that were used up and put all the travel size toiletries in the gym bag to get used up there. Now I know everything that is in that basket and won’t buy duplicates! I also got rid of my old purse today. I only had one but it wasn’t suiting my needs so I bought another one last week…so Tuesday’s mission was easy for me! I also started tomorrow’s and have three bags next to the front door of clothes to donate! I’m taking them today when I pick up my daughter from school. YAY! Hi Mika, you sure are doing a good job of those mini missions and there are so many old ones that you can go back and follow when you feel inclined. I am glad that you had the initiative to find an alternative mission for the one that you had no clutter for. Well done! Hi all Happy New Year and I trust your Christmas was as Merry as you needed it to be! Actually a hell of a lot of other stuff went out the door via a bin, Salvo drop off, recycled or passed on YAY!!! I’ll probably be able to do 365 things a day for a week!! Even though I’m up with it I have discovered a Black Hole that keeps moving around the house and dropping stuff off haha. As for your make-up convo’s going on here yes ladies de-clutter it regularly if you wear it often or not because you just pass bacteria back and forth, don’t feel that expensive must be better because all make-up brands use basically the same ingredients (eyeshadow and blusher are really just coloured talc) hypo-allergenic everything doesn’t mean you won’t react especially de-clutter these regularly because they just don’t last, I go through a huge amount of make-up at comps and concerts and I use washable brushes etc but like most things once you open it you have to use it or lose it! Make-up is just one of those things that really shouldn’t be stored. Amen to that. Love that you’re still going Colleen and I just love being able to check in and chuck out, I find I keep myself motivated by being able to have a good read. Thanks everyone and here’s to a spacious new year ahead. Thanks Dizzy and I love your song. So are you moving far or just changing houses? What you say about make-up is correct ~ it gets full of bacteria over time and the expensive stuff is no better than the cheap stuff so save your money.